Today I used up some dye concentrates which are no longer much use for dyeing as they have been sitting around too long. I used Chinese calligraphy paper and folded and clamped the paper in the Itajime style then dipped the corners into the dye. My intention was to wear gloves but I would keep them on for the main dye bits and then take them off for fiddly bits then forgetting to put them on again. Consequently I have strange coloured finger tips. The paper is drying at Whitireia and couldn't be moved due the heavy rain which fell just as I needed to leave , so I will take photos tomorrow. Here is a link to another website with photos of Itajime on paper. When the paper is dry, I need to see whether the dye rubs off. If it does too badly I will shellac the paper when I use it for bookmaking or collage. 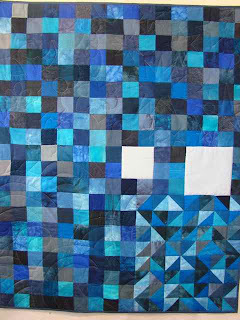 Here is a photo of the first commission quilt I made for Clemenger BBDO. I hope I will get to see the advert it eventually ends up in. It has 2 pale blue shapes which are to have pictures projected into them.